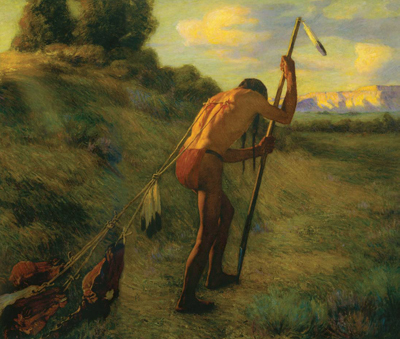 J. H. Sharp, The Stoic, 1914, oil, 53" x 62"
Collection of the Museum of Fine Arts, NM In supreme grief, like the the death of the favorite warrior son, the Indian would cut the muscles of the back, tie the buffalo thongs to them - with several pony heads at the other end, and drag around the hill side from sunrise to sunset, or until the thongs pulled loose - to prove he was a brave man and had the courage and fortitude to face any trouble. In 1926 John D. Rockefeller Jr. returned to Taos for a visit on his way to the Grand Canyon. Sharp’s studio was one of his first stops, and the artist later received a check for $975 and a letter to forward 5 paintings to Rockefeller’s home in Maine. Although the Great Depression loomed on the horizon, Sharp would never again experience financial worries. The summer was memorable in another way. Sharp attended the reunion held at Crow Agency to celebrate the 50th Anniversary of the Battle of Little Big Horn. In addition to a great number of Indian survivors, a few soldiers who survived were also present, among them “Two Gun” Bill Hart and Colonel Edward Godfrey, who as First Lieutenant had commanded Company “K” under Captain Benteen. J. H. Sharp, Rabbit Tail, oil, 18" x 12"
Black Thursday, October 24, 1929, the day the stock market crashed, was the beginning of the greatest economic depression in America’s history. Panic spread quickly as thousands lined the streets on every city, desperate to withdraw their monies as one bank after another collapsed. In the general wave of despair that followed, spending came to a near standstill, hoarding became a national obsession, and business retrenched. In Taos people gathered whatever holdings they possessed and secreted them protectively in their homes. 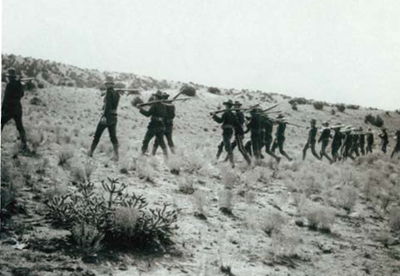 In addition to other factors, the gathering depression had contributed to the decline of the Taos Society, although there is no official record of its dissolution. The Society was beset by problems that its members had been unable to resolve, and by 1927 the Society had simply ceased to function. 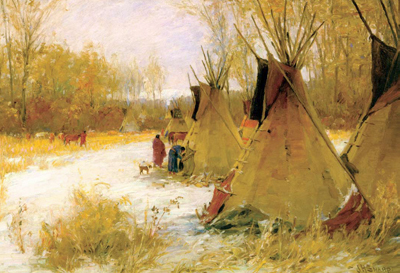 When asked why he painted Indians, Sharp replied: I was always interested even as a small boy. I guess it was Fenimore Cooper who first attracted me to the Indian. It was a romance of youth, of boyhood I suppose. Then when I came to know them I liked them for themselves. Perhaps they attracted me as subjects because of their important historical value as the first Americans. There were growing indications that Sharp’s work was increasingly sought after. 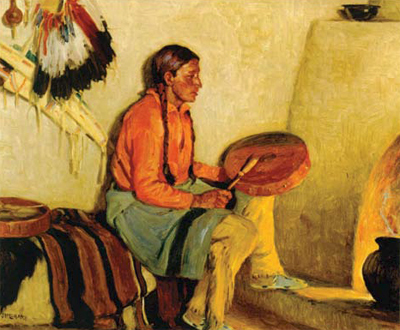 Over the years, he had donated paintings, including The Stoic – one of his most famous works – and two portraits of Taos Indians, to the New Mexico Museum of Fine Arts in Santa Fe. The museum was approached by an individual described by Reginald Fisher, the director, as a “prominent Los Angeles private collector”. 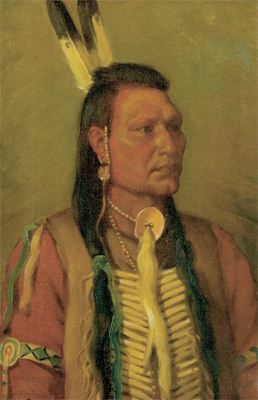 According to Fisher, the collector wanted to trade the museum for the two Taos Indian portraits. In his letter, Fisher informed Sharp that the museum staff viewed the trade as “quite desirable” because it would “fill in the gaps in our permanent collection,” and added that the museum would still be left with three of Sharp’s paintings. Before making the exchange, however, he thought it proper to obtain Sharp’s approval. 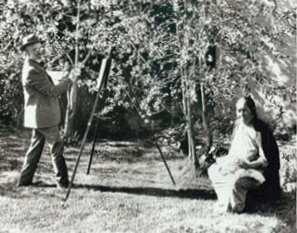 Sharp’s response was admirable and firm: “I did not give the pictures to the Museum to get rid of them…” Sharp added that if the collector wanted Indian portraits, there were still a number available in his studio. Sales were generally slow for Sharp during the war years. It became more difficult for him to paint because he could no longer see clearly the faces of the models; consequently he painted larger figures on larger canvases. Now nearing his ninetieth birthday, Sharp was honored with one last show, a retrospective of 236 paintings, the largest collection of work ever displayed. All but eighteen of the paintings had been completed in 1910 or earlier, and sixteen has been painted before 1900. The exhibit opened at the newly established Gilcrease Museum on September 25, 1949, two days before Sharp’s ninetieth birthday, and continued through December. Sharp labored for days over descriptions of each painting, writing comments about their historical backgrounds. Most of Sharp’s collection of relics and more than 500 of his best paintings were now in museums: The Butler Institute, the Woolaroc Museum, the Phoebe Hearts Museum of Anthropology (formerly the Lowie Museum), the Gilcrease Museum, the Smithsonian and the Cincinnati Art Museum. He could indeed look back with pride at his life’s work. Except for Louise, most of his immediate family had passed on, and all of his affairs were in order. At last he could relax. 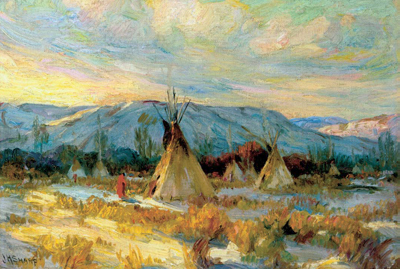 When he left Taos in the fall of 1952, Sharp saw the sun rise for the last time over the rugged Sangre de Cristo Mountains, spreading its warmth and color across the land. 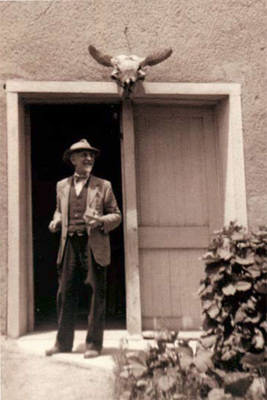 Alois loaded the luggage in the car in preparation for the trip to the depot at Lamy, where Sharp and Louise would board the train for Pasadena. At the station, the two men looked at each other as they shook hands, perhaps sensing that they would not see one another again. Looking upward, Sharp pointed to the clear blue sky and remarked to his friend of thirty-five years that the day was going to be beautiful. Although Sharp had planned to return to Taos the following summer, his health weakened during that winter in Pasadena. As spring approached, he was too ill to undertake the journey. Sharp passed away in his sleep on August 29, 1953. A small memorial service was held in Pasadena, and Alois and a few friends and relatives gathered to say farewell. In Taos a larger affair took place, and many artists and friends from Cincinnati, along with the Cincinnati String Quartet, came to the mountain community to pay their respects. Ernest Blumenschein gave a brief address, recounting the circumstances under which he and Bert Phillips had first met Sharp in Paris, how Sharp had described Taos with great enthusiasm, and how other artists has later gathered in the village and eventually formed the Taos Society. And so it was over. Joseph Sharp had come across the decades with a brush and an easel and an unshakable faith in the transcendental and redeeming values of art. He had seen the unpredictable turns of history, dark and bright, and had seen the country change. Yet he remained in love with the past. He was neither a prophet filled with spiritual insight nor a genius blazing new artistic pathways, but simply, as Blumenschein said, a recorder seeking to express some small part of the strange and unknown destiny of our land. In remaining faithful to his purpose, Joseph Henry Sharp left to the future an important and lasting legacy. And now he belongs to the past he loved so much.